Do you want a life you live on your own terms and not one that feels like it happens to you? Nanci Danison found out how to create a happier life in the most dramatic way possible. She died! During the most extensive afterlife visit ever reported, the author was shown and told that we souls consciously and unconsciously create our own physical reality during human life through an incredible spiritual power called manifesting. 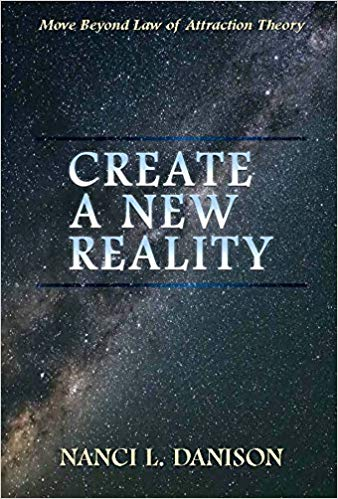 Create a New Reality—Move Beyond Law of Attraction Theory introduces you to the power of manifesting and leads you step-by-step through how to create more opportunities to better your life, to replace old beliefs that hold you back from creating a happier life, and to heal yourself of physical and emotional wounds. Learn why and how you have the amazing ability to literally change the physical world you experience, as it was explained to the author by God/Source. It is far more powerful than anything you may have read about law of attraction theories. Until 1994, Nanci L. Danison, Esq. lived the life of a successful trial lawyer with a national health law practice in a large Midwestern law firm. Then, she died during an invasive radiological procedure before surgery, plunging her farther into the afterlife than previously thought survivable. She returned to share her memories of what she learned in heaven and wrote her first book “Backwards: Returning to Our Source for Answers.” This book and others provide vivid descriptions of the author’s death, entry into the Light, receipt of knowings that answered all her questions, meeting beloved Light Being friends, having a life review, recalling hundreds of previous lives, and witnessing Creation of the universe and mankind’s history of religions. Visit www.backwardsbooks.com for more information. This entry was posted in Uncategorized and tagged author, books writer, Create a new Reality, Nanci L. Danison, Today's Honoree. Bookmark the permalink.